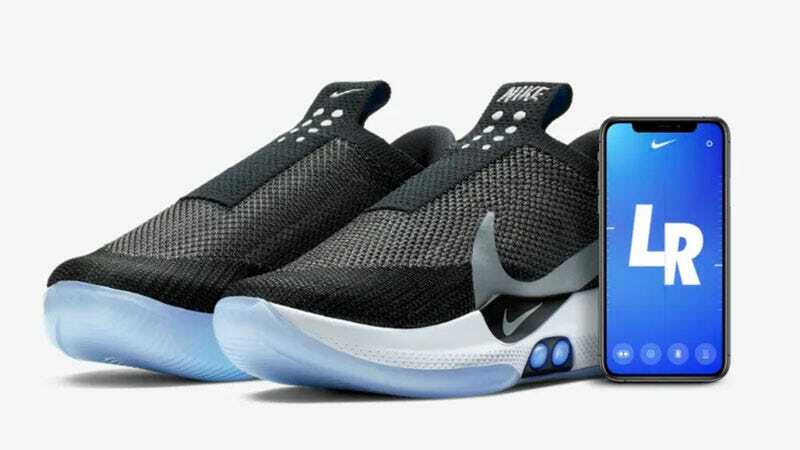 You can adjust Nike Adapt BB sneakers through a smart phone app. Or, you should be able to. Michael Rivera, now 17, has been a sneakerhead since he was a little kid. His mom, who goes by Tootie, saw an opportunity: Get straight A’s in school, she told him, and you can get a pair of sneakers. Michael put his mind to it, and Tootie and her husband kept having to buy him sneakers. A deal’s a deal. With every report card with straight A’s, she got him a new pair of sneakers. “They kept getting more expensive,” she tells Deadspin. This year, he wanted something at the top of the price point: The Nike Adapt BB, a $350 performance basketball sneaker that released last week. The Adapt BB pure platinum, which received a massive amount of hype from prominent publications last month, is $350 because it features Nike’s new technological gimmick: The shoe contains a computer. It does not have laces, but it “laces” itself by tightening around the foot when the wearer steps into it. The wearer can adjust the sneakers on the side. A Nike-made app can also adjust the sneakers and change the colors on the side. It’s overhyped and stupid as heck, but also: Wow, it’s kind of cool. This is not Nike’s first “self-lacing” sneaker. The company released the Air Mags from Back to the Future II in 2016, but they were an extremely limited release for charity. That same year they also released the Hyperadapt, which came in a variety of colorways from that year to 2018. Tootie and Michael passed on the Hyperadapt BBs. Though pairs can now be found on the secondary market for as low as $455, they were $720 at retail and relatively limited. “But for the cost, we didn’t go that route,” Tootie says, “Plus, we probably couldn’t get them.” But she did preorder the Adapt BBs for Michael during the hype-cycle last month. They arrived last week. Michael loved them. He’s had sneakers his whole life, but finally he had a pair he could put on all by himself. Michael has cerebral palsy, and is unable to tie his sneakers himself. The Adapt BBs, like Nike’s FlyEase line, can offer a much-needed solution for customers who have a condition that prevents or hinders them from tying their shoes themselves. Yes, sneakers now come with firmware updates. And, like any computer, they come with bugs. The issue appears to have first been brought to public consciousness earlier this week by New York software engineer Jonathan Warner, who tweeted about problems users were reporting with the sneaker’s Android app. Nike, which did not return Deadspin’s requests for comment, said it planned to issue regular firmware updates for the sneakers, touting new features it could add to the shoe and the app experience. It said the sneakers would have one right out of the box. It did, and people are having issues with it. But even if it’s a massive set of user error, is this the future of sneakers: Kicks that could brick at any time? This particular problem isn’t particularly dire. While the left shoe does not work with the app, the sneakers still work; Michael says he can adjust the left sneaker using the buttons on the side.